When I was a little kid, my dad and I would go fishing. Dad would fill the cooler with soda and water. Mom would make us sandwiches and chips. I'd help dad load the truck up with fishing poles and fishing tackle boxes. Dad would crab the coolers. And off we go with the boat in tow behind us. I was so excited about fishing with dad. Today, I still enjoy eating fish. I don't get to go fishing as much as I would like to. 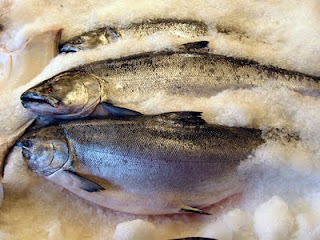 I like going to the fish market, and I always have my camera with me. Preheat the oven to 350 degrees. Spray a shallow baking dish with nonstick spray. Place the tilapia in a baking dish and drizzle olive oil over top of fish, then sprinkle evenly with creole seasoning. Bake 12 to 15 minutes. Enjoy! Never heard of the champ...I'm always interested in stories like that though...Sounds like a great simple way to cook fish. Hey Bo, if you like, go to Google and type, "Lake Champlain monster", then click on images, and you can see pictures of Champ. You can also go to http://en.wikipedia.org/wiki/Champ_%28cryptozoology%29 and read about Champ. Have fun reading about Champ. Such a fun story! I love a basic tilapia this sounds wonderful! You mean there's ANOTHER Loch Ness Monster aka Champ? Sounds great fun! 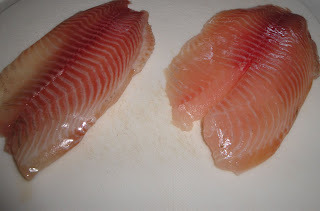 Love the look of your Tilapia. Never heard of that before. Must try it. Hi Jill, Lake Champlain, the Champ. Reminiscent of the Loch Ness Monster, Ogopogo. I think you will like the Tilapia. Thank you for stopping by. I am so thrilled to meet you. I love your story and also your way of cooking tilapia. I miss my dad too. I am so thankful that I have all those wonderful memories. Thanks for stopping by. As always, I love hearing from y'all. Wow! Oh my! I am VERY excited and honored to be award on your blog! I cannot express enough how much I appreciate it! Thank you so much!